Christmas 2014 is almost here! I can’t believe how time flies. Hoping for a nice quiet holiday with my family and friends. Got my tree up and getting the house ready for our new addition, Bettie Jean. She should be here this week, hopefully. I am so excited! We went to Madison, IN and picked up the frame. Thank you Billy, for all your help! I don’t know what I would do without you. Carmela and I took the U-Haul back and dropped it off. That thing was HUGE.. Don’t think I’ve ever driven anything like that and of course my bestie had to take a pic. Will post that later. 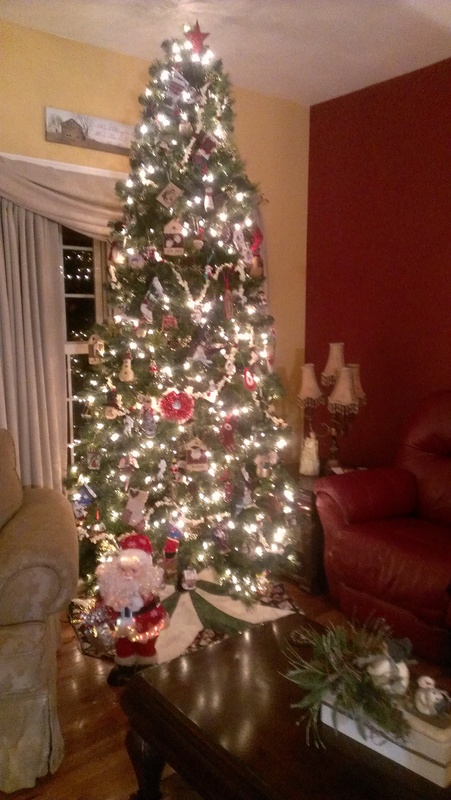 Here is one of our tree. I think she turned out quite beautiful. Prettiest one we have had since Christmas 2011. We lost Devin in August of 2012 and I could barely make it through, much less decorate my home. Devin loved Christmas, so I try to feel him with me as I go through the next couple of weeks. As long as my kids are with me and my Billy, I will make it and it’s nice to know that now.